Do not run out of your discount code Dietbox! Take this great savings Dietbox. Code 5 euros discount at Dietbox. Sign up to the newsletter to get the latest news and promotions! 5% Off Your Purchase Dietbox. Dietbox is a healthy food discovery e-commerce of Spain. Offers healthy food and products by buying in the online supermarket with shipping in 24 hours. Works with more than 110 exclusive brands such as Umaicha, Amix, Weider, María Natura, Aneto, Natural Zero, Real Quinoa, among others. Each box contains between 5 and 10 healthy foods: you choose the monthly, quarterly or half-yearly subscription and you receive the first box between 24 and 72 hours. Web has a section of recipes with useful tricks and a Nutri Coach service to define objectives, motivation, overcome obstacles, the environment, physical activity so that the person is the protagonist of your plan. In the shop section, buying is simple, has a search engine by price, products, intolerances and brands. What are you waiting for? 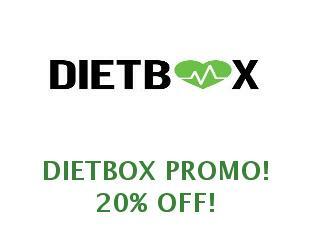 Go to dietbox.es today!